SCVHistory.com LW3327 | William S. Hart | 'The Primal Lure,' Publicity Photo, 1916. 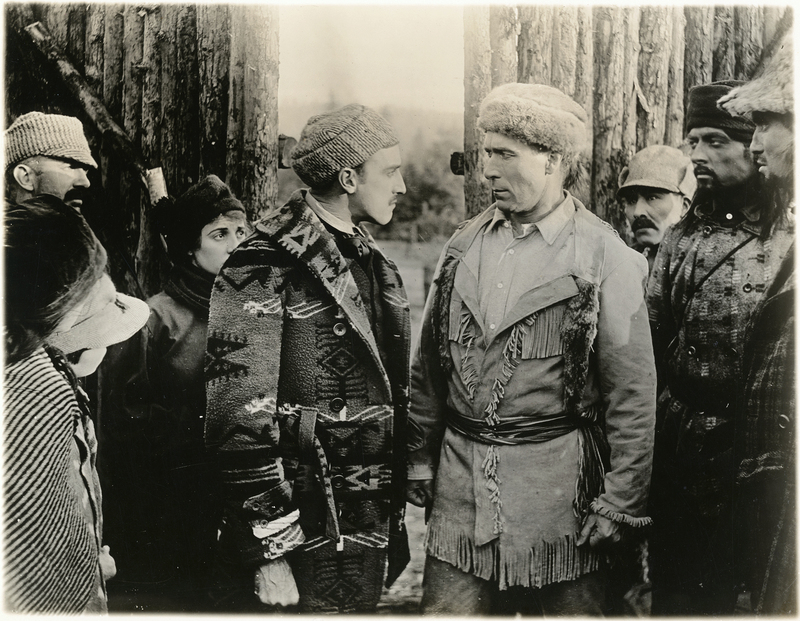 William S. Hart's character is very nearly burned at the stake by Indians in "The Primal Lure" (1916). Never mind that Indians in North America didn't burn people at the stake. 8x10 publicity still or mini lobby card. Partially filmed in Felton, Santa Cruz County, Calif.
Hart is paired with Margery Wilson, who was also his screen partner in another, more famous 1916 picture, "The Return of Draw Egan." "The Primal Lure" wasn't particularly well received in 1916, and it will never be famous in posterity because it no longer exists. All that's left of it are some publicity materials. In an effort to diversify his roles, Hart began filming "The Primal Lure" early in December 1915. Set in Canada, the picture had Bill playing a Scottish manager of Fort LuCerne, an outpost of the Hudson Bay Company. The production crew spent Christmas that year at Felton, California, where the company shot the trapper story among the giant redwoods. When the movie was released, critics admired the scenic locations, but most found its story ineffective. Diehard fans complained that the picture was a disappointment and urged Bill to stick with his customary good bad guy roles. Produced by the Triangle Film Corporation under the supervision of Thomas H. Ince; distributed by Triangle; in production December 6, 1915 - February 2, 1916; released May 21, 1916; production cost, $18,968.55; five reels. Directed by William S. Hart; screenplay by J.G. Hawks from a story by Vingie E. Roe; photographed by Joe August. CAST: William S. Hart (Angus McConnell); Margery Wilson (Lois Le Moyne); Robert McKim (Richard Sylvester); Jerome Storm (Pierre Vernaisse); Joe Goodboy (Indian Chief). SYNOPSIS: Angus McConnell is the "factor," or manager, of an outpost of the Hudson Bay Company. Lois Le Moyne, daughter of a trapper at the post, cherishes a secret love for him. Having made him a pair of moccasins, and embroidered his initials on them, she one day slips into his office when she thinks he is out, to leave them in his desk. But it so happens that McConnell's account book has been stolen, and when he hears her at the door he slips into hiding, thinking he may catch the thief. When he sees the girl go to his desk, he rashly comes to the conclusion that the trappers have hired her to steal his records, and roughly seizes her, accusing her of the theft. The girl, maddened and heartbroken, indignantly denies the accusation. The factor nevertheless thrusts her into the rough prison of the post, and tells her she shall not come out till she has confessed for whom she stole the book. But there arrives Richard Sylvester, an inspector for the company, who is bewitched by the prisoner, and has hei released. Soon after, he procures the dismissal of the factor, and takes the place himself. But he does not win the girl. The visitation of a plague and an attack by Indians prove the unworthiness of Sylvester, and McConnell resumes the post left vacant by the other's desertion. The Indians, in overwhelming force, demand a sacrifice to their great spirit, that the plague may abate. LW3327: 9600 dpi jpeg from original photograph purchased 2018 by Leon Worden.